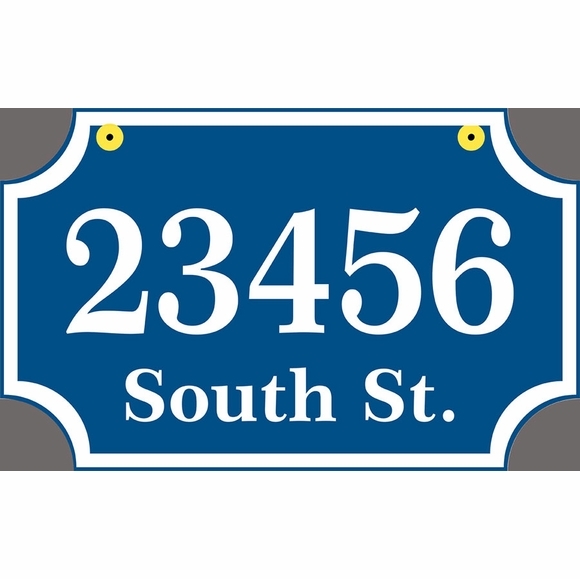 Personalized 2 Sided Rectangle Hanging Address Sign - - featuring unique cut-out scalloped corners. Double-sided 16"W x 10.5"H personalized plaque with two lines for your address. Made in USA. Fast turnaround; ships in 3 days. Line 1 holds up to five (5) 3-inch characters. Line 2 (optional) holds up to ten (10) 2-inch characters. Dimensions: 16"W x 10.5"H x 1/8" thick. Colors: sky blue with white characters, black with white characters, or white with black characters. Thin white or black stripe around the perimeter highlights the scalloped rectangle shape.